Fuji by Gerhard Richter is an abstract print by the world renowned German painter. Variously evoking something of Rothko’s exuberance of transformative color, Pollock’s instigation of autonomous composition, and de Kooning’s transferal of the figural to the abstract, Richter’s abstraction is ultimately without comparison. Gerhard Richter (born 1932) is a German visual artist and one of the most famous abstract artists of the 21st century. During the span of his career he has ceaselessly interrogated the limits of representation, the nature of perception and the operations of visual cognition. Richter studied at the Dresden Academy of Fine Arts and worked as an apprentice to a sign painter, photographer, and painter. By the 1970’s Richter was well established as a prominent painter being widely exhibited. He held his first solo show in 1969, and continued to show in groups within Germany as well as internationally in cities including Tokyo and New York. Having dabbled in Geometric abstraction in 1966 Richter now returned to this form in 1971. 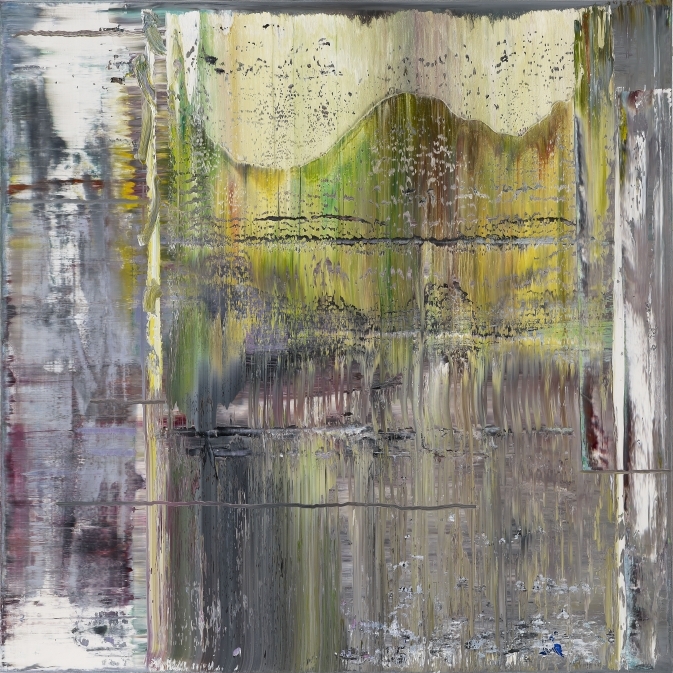 The Grey Paintings (a range of grey monochromes) that Richter had started in the mid 60’s continued into the 70’s and formed a significant part of his body of work. Throughout the 70’s and into the 80’s Richter explored the possibilities that abstraction and minimalism had to offer. While abstractions and landscapes were a prominent part of Richter’s work it was another series of photo-paintings that were to be Richter’s most significant work of the 1980’s. The 15 photo paintings that depicted the story of how the Red Army Faction came to an end with the suicide in prison of two of its most notorious terrorists. The politically provoking works divided opinion as they brought to the forefront Germany’s position in the post war era. By the end of the 1980’s Richter was without a doubt one of Germany’s most prominent artists, selling extensively in the international market. Abstraction continued as Richter’s medium of expression well into the 1990’s. A retrospective of his work was organized in Paris in 1993. In 2002 yet another retrospective of his work was held at MoMA in New York entitled “Forty Years of Painting”. Richter continues even today to explore his art through abstraction.